Tomatoes are truly the heart of summer, especially organic heirloom beefsteak tomatoes. Tomatoes are truly the heart of summer, especially organic heirloom beefsteak tomatoes. Now that August is here, tomato time is upon us, and there are so many good beefsteak recipes to try. If you and your family love tomatoes, why not make them the main course? Locally-grown heirloom beefsteak tomatoes deserve to be the star of the show, and these three recipes use them in the best possible ways. If you haven’t already added burrata into your repertoire, this summer is the time to do it. Burrata has become one of the most celebrated cheeses and is a popular appetizer choice among even the most luxurious restaurants. When paired with heirloom beefsteak tomatoes, the two come together perfectly. This simple recipe just needs thickly sliced heirloom beefsteak tomatoes, drizzled in olive oil, seasoned with salt and pepper, and then topped with a delicious ball of burrata. Cut the burrata open, and let the juices mix together to create a bright marriage of flavors. When looking to impress your guests at an end-of-summer dinner party, making an heirloom beefsteak tomato tart is the way to do it. If you’re an experienced pastry chef, go ahead and make your own crust. If you’re not, a store-bought crust is totally acceptable as well! After slicing the beefsteak tomatoes into ¼ -inch slices, salt them and let them drain excess water in a colander by layering them upon paper towels. When you fill your crust, slightly stack the tomato slices on top of each other to create a solid layer. Bake in a 425-degree oven for 40 minutes, allow to cool, then serve! This recipe is great for those who don’t have a second to spare! 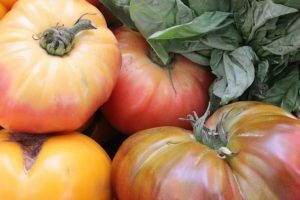 You can make this tasty heirloom beefsteak tomato recipe easily or even ahead of time to cut your time down. Cut four large heirloom beefsteak tomatoes horizontally into thick slices. Season with parsley, thyme, garlic, salt, and pepper, and then drizzle with olive oil. Bake in a 450-degree oven for 35 minutes, and after removing the tomatoes, add the breadcrumbs and parmesan cheese. Bake for an additional 10 minutes. You can find our fresh, non-GMO, sustainable heirloom beefsteak tomatoes in national grocery store chains, produce distribution companies, roadside farm stands, local farm-to-table restaurants, CSAs, and farmers’ markets. To learn more about ordering our fresh local produce, click here. This entry was posted on Friday, August 3rd, 2018 at 4:00 pm. Both comments and pings are currently closed.